With blood pressure awareness month ahead of us, its time to talk about fried food. As they are biggest contributors to high blood pressure and hypertension. Here in Texas, we take our fried food very seriously. Fried foods are full of saturated fats and simple carbs. 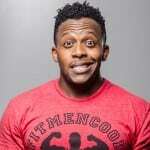 They will not push you further to your health and fitness goals. Today we are going to fire up the Air Fryer. With an Air Fryer, you can actually cut down the calories by more than 60% and even more when it comes to saturated fats. 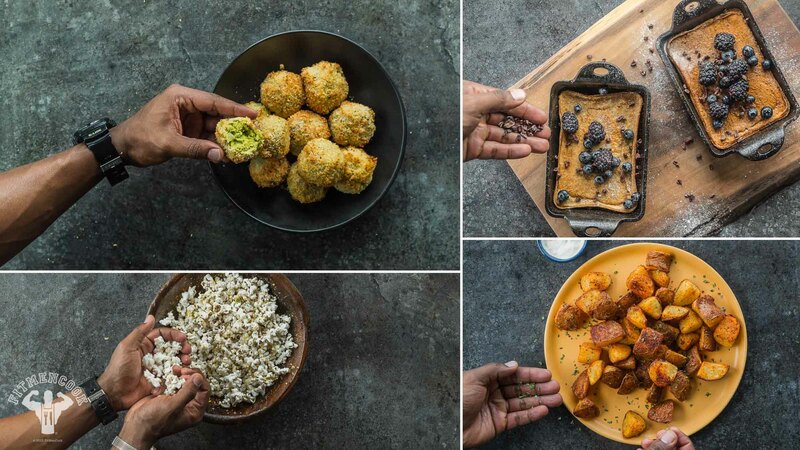 I’m going to show you 4 healthy, must-try air fryer recipes that you are going to love. Are you in the market for an air-fryer? I got you covered, check out my review of the Philips Air Fryer Review that I did last year – it’s the one I’m using for this video series so it has passed the “test of time!” Enjoy the video and my healthy air fryer recipes! Set air fryer machine to 390F (199C). Add the kernels to the fryer basket and lightly spray with a little avocado/coconut oil. 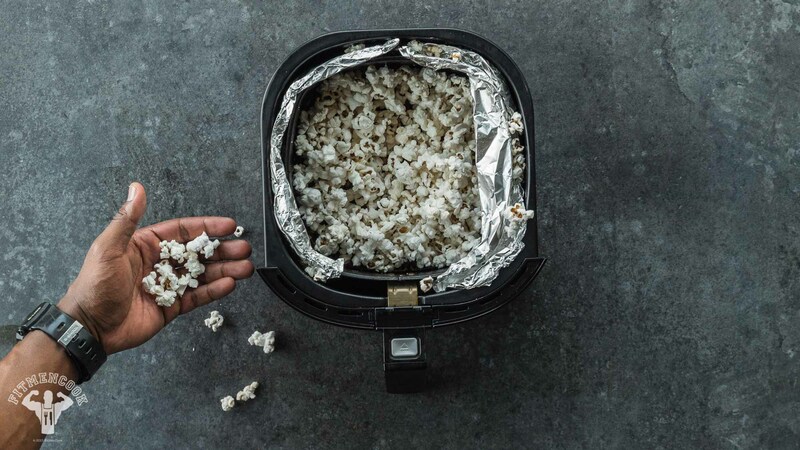 If needed, line the sides of the tray with aluminum foil to prevent popped popcorn from leaving the basket and flying around in the air fryer. Insert the basket and set time for 15 minutes. 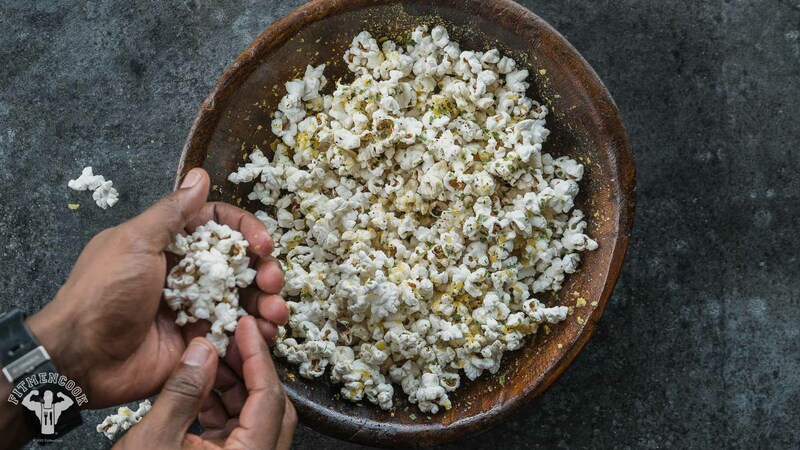 Check on it every 3 to 5 minutes to ensure the kernels are not burning. Once they begin to pop, monitor them closely until the popping sound stops, or until the 15 minutes has expired. Remove the basket immediately and dump the contents in a large bowl. Lightly spray with coconut or avocado oil, then dust with garnish to taste. Bring a pot of water to boil. Add the cut red potatoes and cook for no more than 6 minutes. Immediately remove the potatoes from the water using a strainer and place them on a kitchen towel to cool and to pat dry. Once the potatoes have cooled to about room temperature (about 15 minutes), ensure they are “dry” then add them to a large bowl along with avocado oil, garlic powder and sea salt and pepper. 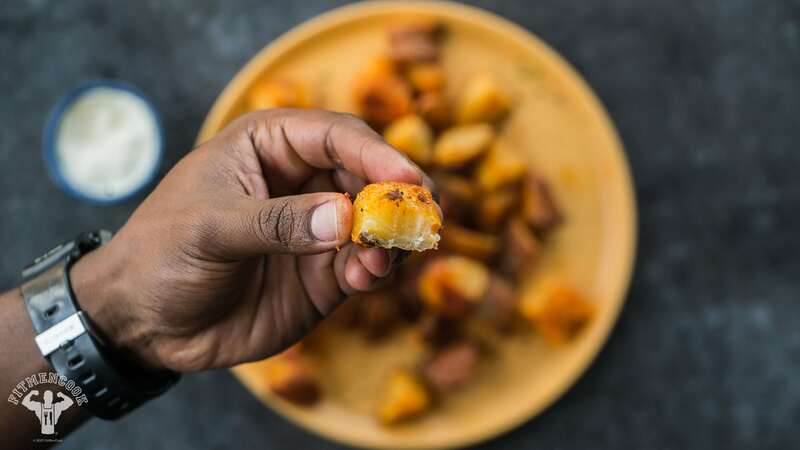 Coat the potatoes then add them to an air-fryer basket, preferably in batches, so not to overcrowd the basket which can lead to inadequate “frying.” Food needs room to breathe. Set air fryer to 390F (199C). Add the basket to the air fryer and bake for 15 minutes, shaking the basket at 7 minutes. To ensure a nice crispy coating, you can also lightly spray the potatoes with avocado oil one last time before frying. The outer layer should be golden brown with crispy flakes. Add the “fried” potatoes to a bowl, lightly spray with avocado oil, then add the seasonings. 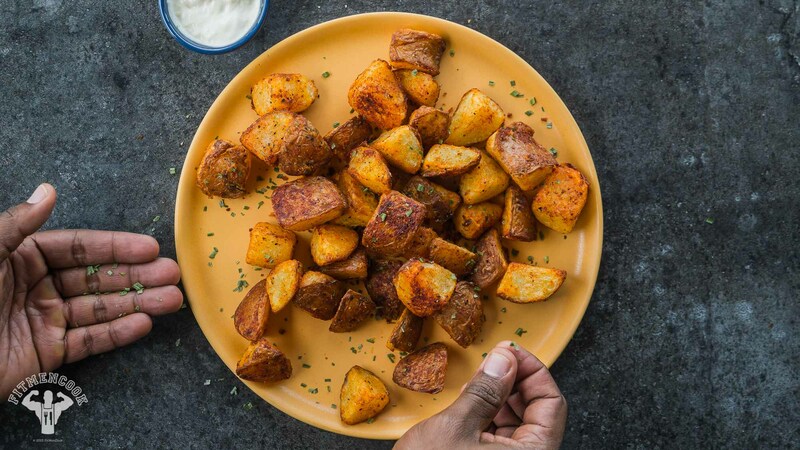 Shake the bowl to coat potatoes then enjoy immediately with your favorite condiment – I used an easy garlic aioli recipe. In a bowl, mix and mash the ingredients for the guacamole WITHOUT the almond flour. Once you have the desired taste, add in the almond flour until it the guacamole is thick, like brownie batter. Add additional tablespoons of almond flour to the batter as needed to make it thick. Be careful not to add too much lime juice as that will make the guacamole wet and loose. Set the bowl in the freezer to harden for 1 – 2 hours until it has hardened. Line a baking sheet with parchment paper or nonstick foil. Use a spoon to scoop out the guacamole and form a ball, about the size of a ping pong ball, with your hands and place it on the baking tray. Repeat VERY quickly with remaining guacamole. Cover the tray with nonstick foil and place in the freezer for at least 4 hours or overnight. Beat eggs together in a bowl. You MUST work quickly and likely will have to do this in batches. Lightly spray a guacamole ball in olive oil to help them get “sticky,” then dip it in almond flour, then the egg mixture, then panko crumbs. 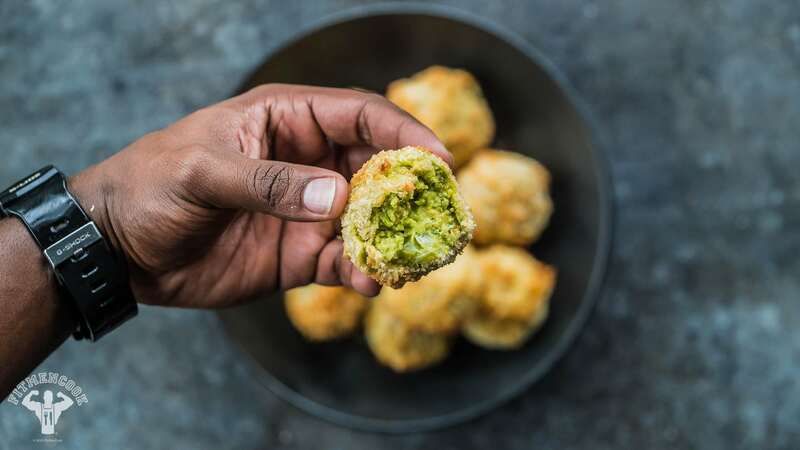 Repeat ONLY until you have enough guacamole balls to fill the air fryer basket (while giving them ample space to breathe), then place the rest of the balls (without coating) back in the freezer. 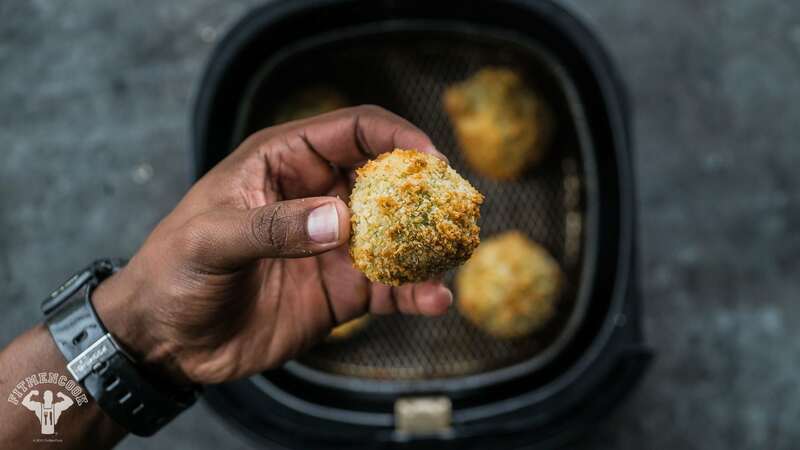 Place the coated balls in an air fryer basket, spray them with a little olive oil and cook for 6 to 8 minutes or until the outside is golden brown. If the balls begin to crack, take them out of the air fryer. Allow them to slightly cool before handling since they become more firm as they cool. Repeat steps 5 & 6 for any remaining balls. Set air fryer to 390F / 199C. 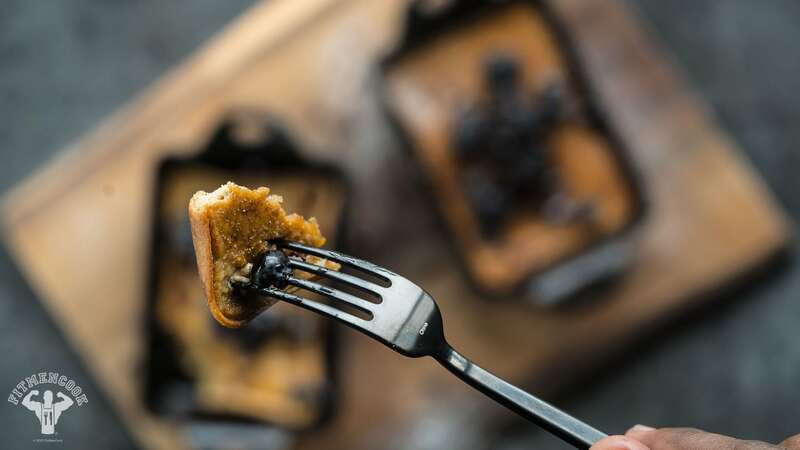 Set the cast iron tray or ramekin inside the air fryer as it heats. Add all ingredients for the batter to a blender and blend until smooth. If the batter happens to be too thick, simply add tablespoons of milk and/or applesauce to thin it out. 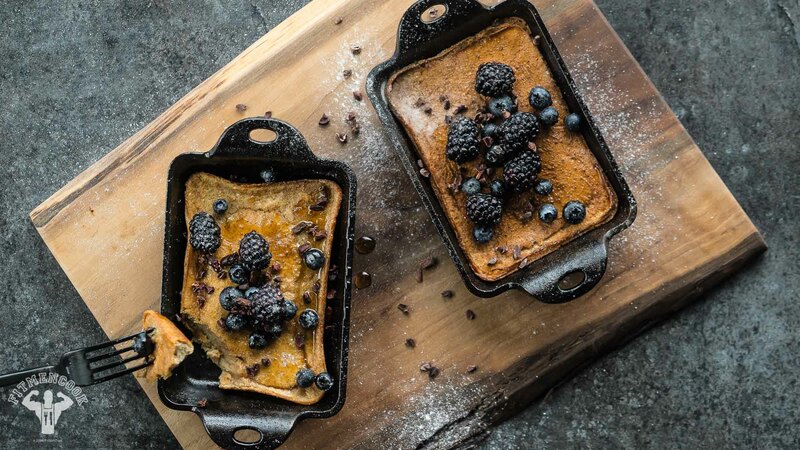 Spray a cast iron tray or ramekin with nonstick baking spray, then pour in a serving of the batter. Air fry for 6 to 8 minutes. Do NOT worry if the top comes out kind of “hard” to touch. That’s the benefit of using the air fryer – it gives the pancake a nice firm outer coating/edges that softens as it cools. Store the remaining batter in an airtight container in the fridge to make it fresh every morning.